For the scientifically or academically inclined, check out the botanical drawing poster, chemistry style molecule print, or the “Procaffeinating” definition poster. Those who like color will enjoy some of the more funky designs featuring coffee brewing devices in bright hues. If you need to find a new recipe or want to try a new brew method, check out the exhaustive infographic style posters, which are great for learning the craft. There's even a nifty DIY poster, which involves using a craft knife to make a papercutting masterpiece. We've gone through many different styles of printed posters online to give you a great selection that are excellent for that blank wall you've been staring at for so long. Or if you are a print collector, there are some new choices that might be just the right thing for that collage-style wall art you've been building. Get ready to show your inner botanist with this botanical drawing-style print of the coffee plant also known in Latin as Coffea Arabica. 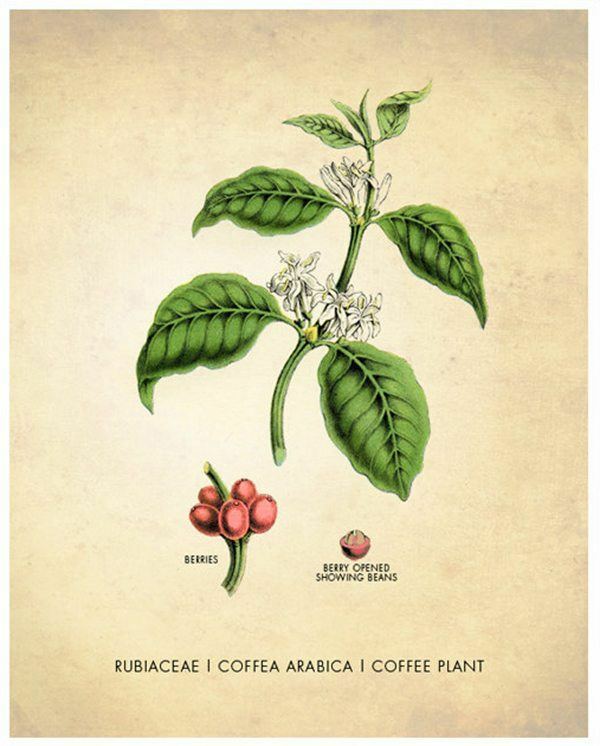 Within the family Rubiaceae, as defined on this poster, the coffee plant is shown both flowering and fruiting,with a bonus close up of the coffee cherry, which is the most delicious part. Show appreciation to the origin of the bean with this lovely illustration-style print. This is perfect for those who like a collection of food related botanical style drawings for their kitchen or dining room decor. 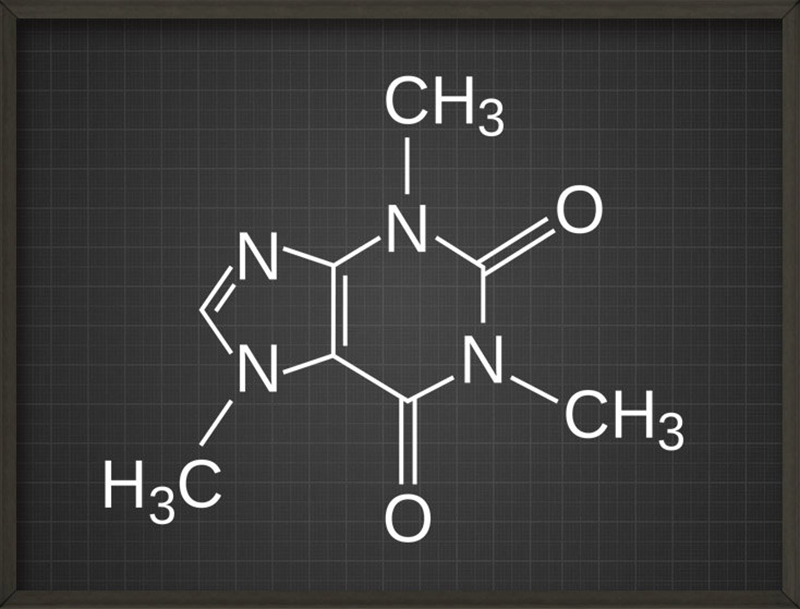 The chemical structure of the Caffeine molecule is proudly on display in this particular art poster. With several choices as to the size (8″ x 10″ and 11″ x 14″) and the background on which it is printed (black graph, aged rustic, light ivory, chalkboard, blueprint). Make it extra scien-tastic with the blackboard background, or match it to your vintage style with the aged rustic background. It comes ready for you to add with your favorite frame or you can simply hang as is for the more minimalist minded. Short on ideas for making coffee and want a suggestion? 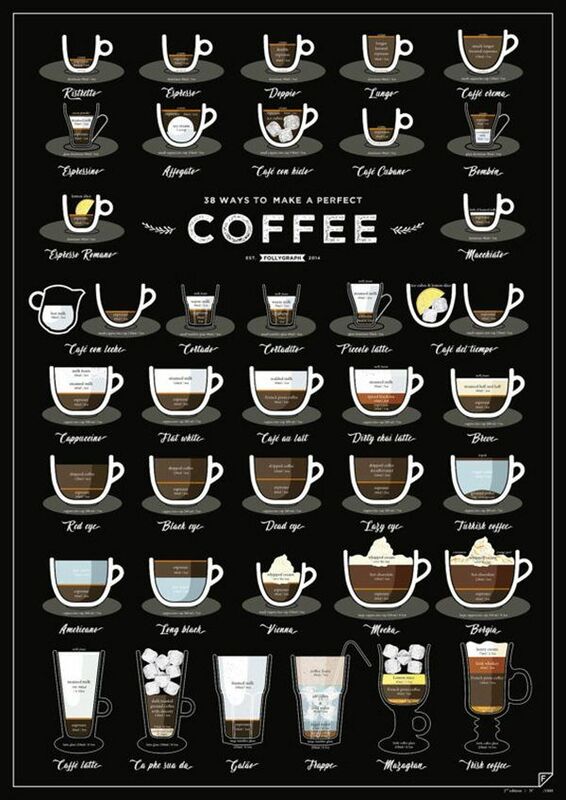 Just look up at the infographic-style poster that lists 38 recipes for just that sort of thing. Printed on age-resistant archival quality paper, you can be sure that it will last when it is framed on your wall. Enjoy searching for your favorites like the Americano and Latte, or the more unusual and less well known Borgia or Black Eye.